It's a good bet that drivers have been talking to their cars since Karl Benz rattled down a dirt road in his first three-wheeled horseless carriage. Of course, those conversations were probably one-sided variations on, "Why won't you start?" and "Where's that noise coming from?" or the ever popular, "Please, please make it to the next gas station." Today, of course, many cars don't just respond to your voice, but they actually talk back. 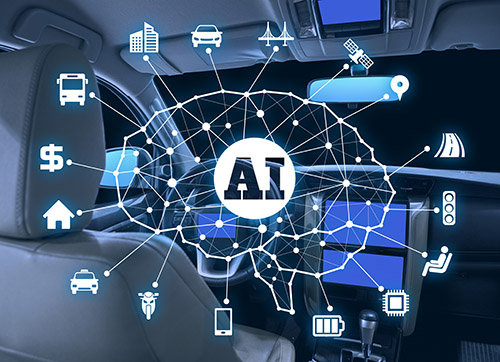 Voice-activated navigation, music selection and even climate controls are all part of the growing body of technology more broadly known as telematics. The idea behind telematics is not only to integrate navigation and radio, but to also give you access to texting, email, sports scores, weather reports and virtually anything else that you'd normally have sitting at your computer or on your smartphone. While virtually every company has something in the works, some are farther ahead than others. In fact, some – BMW and General Motors in particular – have been on the cutting edge of telematics before the word even existed. BMW has been adding functions to its iDrive system since it was introduced a decade ago, and a couple of years ago the company finally made iDrive easier to use. GM's OnStar may be the granddaddy of modern telematics, with its automatic collision notifications and turn-by-turn navigation debuting years before similar systems hit the market from other manufacturers. We've rounded up six of the newest systems to see what they offer and how they'll make their owners’ lives easier in the future. While Audi isn't quite on the Internet bandwagon yet with its Multi Media Interface, it's definitely in the works, along with a clever control system that promises to make MMI easier to use. The new controller – first seen in the 2012 Audi A8 – uses gestures (for example, that finger sweeping used to open and control apps on an iPhone) to help you navigate the screen. The idea is to incorporate the now-familiar action into cars, and make using the system easier. MMI also uses Google Earth for its navigation maps, with its constantly updated database and interface that shows hills, valleys and road contours. Couple it with MMI's gestures, and you have a unique way of navigating your navigation system. In the future, Audi promises Internet access, along with inter-vehicle communications and a wide variety of other integrated telematics. Audi even goes so far as to say that autonomous operation could be in the future, which begs the question: How soon will it be that our cars get mad…at us? Breakdown: Hyundai is a relative newcomer to the telematics game, but they’ve made it clear they’re gunning for the top of the class. 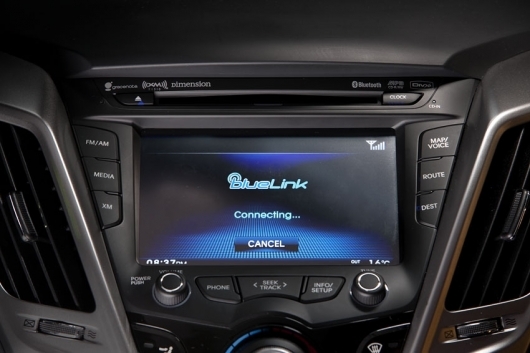 Hyundai's Blue Link system will go on sale this year in the 2011 Sonata sedan and 2012 Veloster coupe and will eventually be in all Hyundai models by the 2013 model year. There are three basic packages with Blue Link. The first is the Assurance package, which bundles OnStar-like functions such as automatic crash notification and emergency and roadside assistance. The Guidance package adds turn-by-turn navigation for points of interest, route adjustments for traffic and gas station locations with prices. Beyond that, the Guidance package includes an advanced search function that uses a combination of voice recognition and a live operator when needed. Also part of the Guidance package is an Eco Coach, which monitors how you drive and sends results and tips to your personalized owner website. But some of the coolest features are nestled inside the Essentials package. It connects with a smartphone app, or simply through text messages or a website, to alert you when the alarm is set off, if the panic button is pressed, or if you need maintenance. It also allows you to post your location status on Facebook using voice commands. But parents will love the four features bundled under the "Safeguard" heading. First there's Valet Alert, which tells you if the car leaves a certain area. The Geofence function expands on that, alerting you as the car moves from one website-configured area to another. Then there's Speed Alert, a fairly self-explanatory function that tells you when a pre-defined speed has been exceeded. Finally there's Curfew Alert, which tells you when the car is being used outside a pre-determined time. Availability: Limited availability later this year. Breakdown: Apps are the buzzword in telematics these days, thanks to the wildly successful App Store for Apple's iPad and iPhone, as well as those for Android and other phones. Toyota is embracing the app revolution with its new telematics system, called Entune. Entune, like most modern telematics systems, incorporates some basic safety features. Bundled under the Toyota name Safety Connect, it basically offers OnStar-like capabilities such as accident alerts, roadside assistance, and so on. Entune also offers up HD and XM radio, USB connectivity, Bluetooth streaming and phonebook connectivity and a good ol' CD player. But what sets Entune apart is apps. 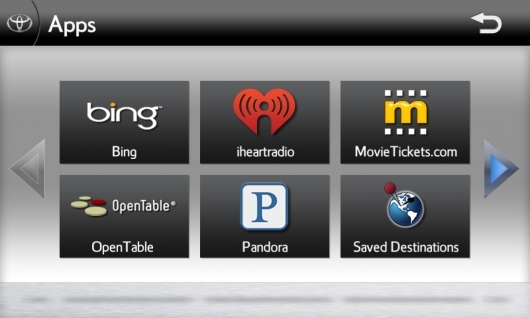 The system will debut with several apps already installed, including Bing, iheartradio, MovieTickets.com and Pandora. These aren't just add-ons either; they're fully integrated into the system. For example, the navigation system is integrated with Microsoft's Bing, which will make searching for destinations easier. OpenTable.com's application will allow you to not just find local eats, but make a reservation too. Afterward, you can buy your movie tickets with the Movietickets.com app and listen to your customized music playlist with Pandora. Download the Entune app onto your smartphone, pair it with your car and you're good to go. Updates to the system will occur with updates to the Entune smartphone app. Entune also integrates what Toyota calls an "advanced conversational voice recognition system." Like the advanced OnStar system, it is designed to reduce the number of commands you have to memorize and make it more intuitive to just "talk" to your car. Breakdown: Ford's Sync system was first introduced on the 2008 Ford Focus as a quick and easy way to integrate your phone or iPod into the audio system. By plugging in a USB cable, you could access your phone's calling list, music playlists or other functions just by speaking, whether your phone had voice dialing or not. It was clever and useful, and it worked surprisingly well. Today, Sync is in its fourth generation, having grown into a full-fledged telematics system, complete with navigation, enhanced voice control and vehicle monitoring. 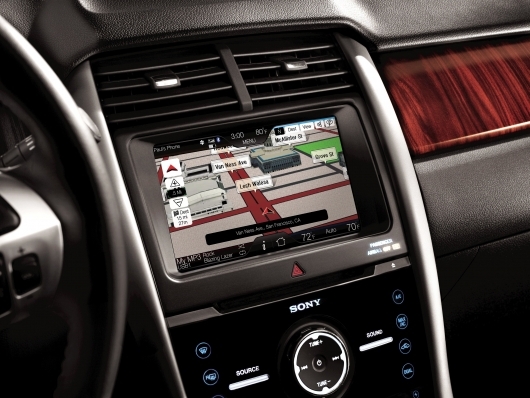 Known as MyFord Touch, the enhanced system still uses Sync's voice activation, but incorporates multiple LCD screens and a host of other functions. But the coolest thing about MyFord Touch is the availability of apps. For example, you can download and install a Twitter app that will speak tweets back to you. You can also turn the car into a mobile WiFi hotspot for up to five users through the use of a USB broadband modem. The downside to the system is complexity. Although Ford says it has worked hard to make the system familiar to users with voice-recognition, color coordination and touch screens, it's important to note that Consumer Reports recently downgraded MyFord Touch equipped vehicles because of the potential distraction the system could cause. Availability: All BMW Models with iDrive; functionality depends on model. Breakdown: BMW says it has been at the forefront of telematics since it introduced the first on-board computer with an outside temperature sensor in 1982. That's stretching it a bit, but the company's iDrive system – first introduced in the 2001 BMW 7 Series – arguably revolutionized the whole idea of in-car computer systems. Although its single-knob controller was widely panned, the idea of cleaning up the interior of its multitude of buttons was laudable, and the huge screen that came with the system was a massive improvement on the tiny displays that were in cars up to that time. 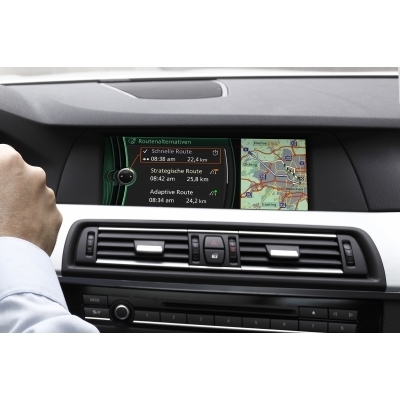 BMW quickly expanded iDrive beyond just navigation, audio and climate control functions. For example, in 2004 BMW was the first manufacturer to integrate iPods into its audio system, and in Europe you can browse Internet pages directly through iDrive, albeit on a slow EDGE network. Today, BMW calls its system ConnectedDrive, and it offers a wide variety of functions, the most advanced having come online in just the past few months. And we do mean "online," as ConnectedDrive allows a surprising amount of Internet access through the car by using the connection in your Internet-capable phone and the iDrive controller and LCD display to browse through web pages. Your mobile phone is billed, so there's no need for additional hardware in the car itself. As a safety precaution, you have to be stationary to do any of this, even when you have a passenger in the car. BMW, as befitting a business-class car company, also offers full integration of your phone's office functions. Browsing contacts is old-hat for many competing systems, but BMW takes it a step further by displaying your contacts’ photos on-screen, allowing you to check your calendar and tasks and even reading your emails and text messages to you using a text-to-speech function. Breakdown: GM has been touting OnStar in its vehicles for what seems like forever, but the blue, red and black buttons first started appearing on GM rear view mirrors in 1997. The history goes back even further though, back to when GM owned Electronic Data Systems and Hughes Aircraft. EDS actually designed the system, and OnStar uses Hughes satellites for its communication. 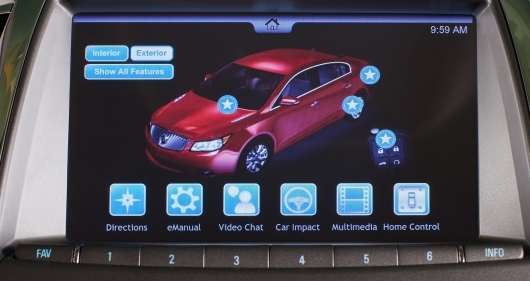 OnStar pioneered many functions that are now considered basic to telematic systems. For example, OnStar automatically alerts local emergency services in the event of a collision; police can track your car if it's stolen – and even slow it down on newer models; you can summon turn-by-turn directions; you can even unlock your doors remotely if you accidentally lock your keys in the car. OnStar has always had live representatives on hand to help you when you push that little blue button, adding to the cost of the system, but making it friendlier for tech-wary drivers. More recently, GM has introduced an app for smartphones that lets you monitor real-time information like fuel levels, oil life and tire pressure. Although OnStar was unique for several years, many companies now have similar systems with similar capabilities. However, General Motors is prepared to take OnStar to the next level, and it introduced two methods of doing this at the 2011 Consumer Electronics Show. The first is aftermarket availability. 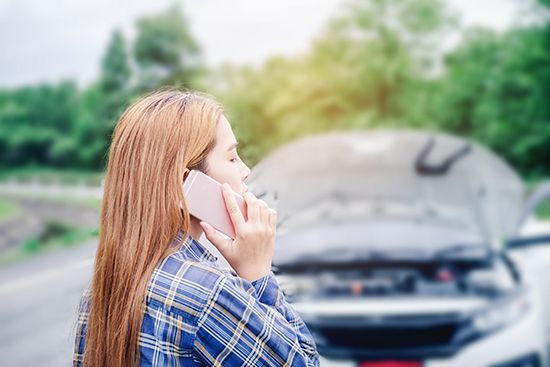 Starting this Spring, anybody can equip their vehicle with the classic OnStar services of automatic crash response, dial-up emergency services, stolen vehicle location, navigation, roadside assistance and hands-free calling. OnStar equipped mirrors will be available through Best Buy and cost $299 plus installation and an additional monthly service fee. GM also showed off a concept Buick with an OnStar system integrated with Verizon's 4G data network. 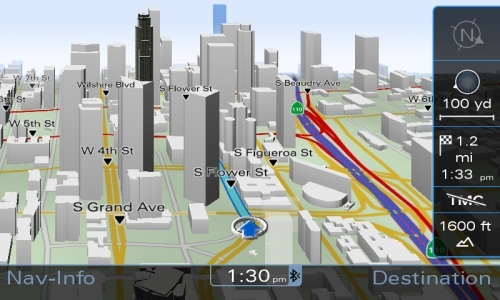 The speed of 4G connectivity could greatly expand what customers could do with telematics. For example, rather than just talking to a voice, you could actually Skype an OnStar representative, with full video chat through your car's touchscreen. What if your car could not only alert you if someone had backed into it in a parking lot, but actually send you video of the culprit in action, along with the license plate? The 4G prototype shown can do that, and much more. GM is quick to point out that none of these features are currently slated for production, but they're all feasible, and they look pretty slick for prototypes. However, one advanced feature that's available on all 2011 OnStar-equipped GM vehicles is something called natural language commands. Instead of saying "dial" or "radio," you simply say "I need to make a phone call," "I want to listen to the radio," or "Is it going to rain today?" Thanks to partner Nuance Communications – the brains behind Dragon NaturallySpeaking dictation software – the computer looks for keywords and selects the appropriate function, putting us one step closer to Star Trek-like computer interaction.